This move is called the "Backwards Battering Ram". What you do is you build your kart with an incredibly bulky back. Then you squeeze your kart out in front of your enemy. Then you dangerously and recklessly shift to reverse and rocket the thing backwards into your opponents kart and demolish them with it. It only works if your kart is strong enough in the back end to handle it of course. It's interesting, because this kart is actually a lot slower then the blue one. The blue one had a rocket engine attached to it and a less heavier design. However, all it took was an inch out in front of the kart to take it out here and a rope attached to the back end of the blue one in the last challenge to launch them to the finish line. I guess it's not all about speed. So anyway, that's the end of the second challenge. The Power Rings win once again. 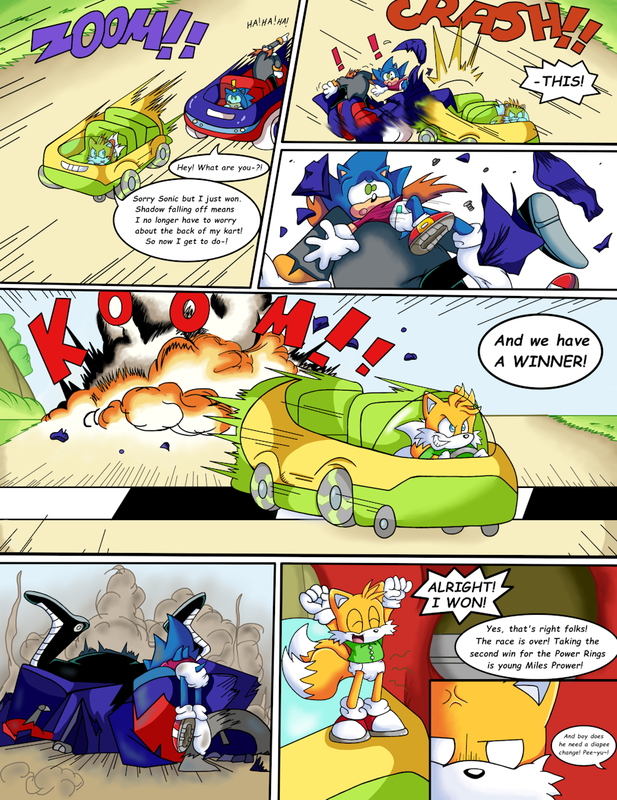 Tails is gonna get the special prize while the Chaos Emeralds have to vote someone off now. Look forward to saying goodbye to someone else again. Next time. Tails: Yup I sure do need a change real bad. I guess he was on such a high from winning he forgot he was wearing a full diaper. Oh yeah. He's gotta take every positive he can get though.